Hello! Well here it is, my first blog entry. I have been wanting to do a blog for sometime now, so right now I am slightly giddy with happiness. I have been running my chocolates & cakes stall for exactly a year. So much has happened within just this one year, so many interesting people I met, so much knowledge I gained. I hope to write down those types of things in this online diary. For the readers who don’t know me, a little introduction: I am a market stall trader at Broadway Market. I am there pretty much every Saturday 9am til 4pm or until whenever I finish selling off all my items! (Come visit me!) Broadway Market is an outdoor street market with a good vibe, very London, with about 60 stalls mostly selling tasty food, & some excellent stalls selling clothing/ bags/ objects/ all sorts. I think it is the best market around in London (ofcourse I’d say that!). Tarte Tatin is currently my favourite tart that I have on my stall & it feels right to be the first to feature. It is an up-side down carameralized apple tart. Wonderfully rustic, classic French tart. It is cooked for about an hour & the apples are so soft (softer than ice cream) & squishy it just melts on your mouth. There are several versions to the history of Tarte Tatin. The one I like is this: Stéphanie Tatin, one of the two Tatin sisters from the small rural town in the Loire Valley in France, overworked & a bit ditzy, baked an apple pie up-side down by mistake but served it at their hotel anyway! I love that there is a story behind it. I also like the way the French people apparently named it ‘tarte des demoiselles Tatin‘ (the tart of two unmarried women named Tatin). It is made with just four or five simple ingredients; apples (approximately a whopping two kilograms of! ), sugar, butter, puff pastry, & an optional vanilla pod. It is simple enough to make too – just caramelize the sugar & butter, align the halved apples & cook on the hob for a while. Then place puff pastry sheet over it & bake in the oven! When cooled, flip over & hey presto, you’ve got a Tarte Tatin! Apparently this tart can easily be made with other types of fruit – pears, peaches, prunes, quince… any fruit experimentation valid. Which makes me think maybe I should try a mixed fruit version like a four-seasons pizza! That sounds fun & could look colourful, no? I was in a minor dilemma about wether I should share my stall recipes online, customers might stop buying my stuff & start making it themselves! But I realize that, afterall, most of the recipes I use are not exactly my own anyway, it’s a mishmash from all sorts of sources, or slightly adapted. So how can I hog it to myself? Besides, if someone trusts my recipes as much as wanting to try it themself, then it is an honour. You will need the following sorted & measured before starting…, & always read the whole recipe first so that there are no surprises while baking. 1. Melt the butter in the pan over the hob. 2. Soon as it has melted, put the sugar & the vanilla seeds in. Let the sugar dissolve. 3. Place the de-seeded vanilla pod skin in the middle of the pan. 4. Tightly align the prepared apples, first from the outside (don’t worry, there should be plenty of apples left to stuff in to the gaps at a later stage). 6. After a while, you’ll notice that there are spaces to shove more apples in. Now is the time to place as much apples as you can (but don’t be tempted to cut your halves in to smaller slices to fill it – it will make the final tart look like one big mass of squashed guu. You want rustic, thrown together look, & the apple shapes still intact). Now switch the hob off. Start to pre-heat the oven to 180 degrees centigrade. 7. Roll out the puff pastry so that the sheet is bigger than the pan. It does not need to be a neat circle. Place on top of the apples. Use your fork (in my case a cooking chopstick) & tuck in the ends inbetween the apple & the pan sides. Note that this tucking-in bit is very important – because if you don’t tuck, the pastry will shrink when baked & be smaller than the pan, & will not be big enough base for the apples once the tart is flipped over. 8. Pierce some breathing holes on your pastry so that hot air can escape. 9. Get any high-sided tray, like a roasting tray & line it with foil. Place the pan in it (the roasting tray is a must-have to collect the pool of more sticky caramel liquid that oozes out while the tart is in the oven – otherwise you’ll have the oven to scrub). 10. Pop it in to the pre-heated oven for 40 minutes. 11. Once done, cool it in the room as is. Once cooled, place on the top shelf of your refrierator (top-shelf because health & safety-wise any food that is to be eaten as is should be on a shelf above anything that is raw like meat, so that there is no risk of raw meat juice leaking on to your tarte). Preferably leave it there for half a day to set the shape. 12. When ready to serve, first, look at the pastry. Is it stuck to the sides of the pan? Use clean fingers to nudge it free. Now get your cake stand. Place the cake stand upside down on to your pan. Using slow & good maneuvering skills, tightly hold both stand & pan together, & flip it over. Drum-rolls. Slowly remove the pan mold. Hey presto! There should be a wonderfully formed tart in front of your eyes! I’m thinking of uploading an entry at a once-a-week rate, so please come back around the same time next week! Congratulations on your new blog! Very nice, very you. Looking forward to following this. 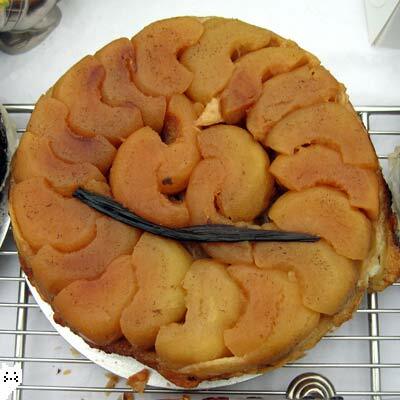 Tarte Tatin.. 美味しそう！Will have to try this soon! It’s a very sweet blog! Congratulations! Welcome to the blogosphere! Your tart looks lovely I have to say… I’d like to experiment with different apple types on this. – Dirk, your support mean so much to me… Thank you. – And thanks Jun, I just hope that my blog is just as long lasting & interesting as yours! I’ll post the four-seasons tatin one day! – Thanks Richard! I just looked at your blog & I like it! It’s now in my check-list! Welcome to blogging Tamami. Your Tarte Tatin looks lovely. I’m currently reading the book by Susan Loomis called Tarte Tatin! Barbara, thanks for the book tip! I love novels with food theme, & the synopsis on Amazon reads well. I’ll just might have to check this one out! Hi Tamami, just found your blog through C&Z and I’m already looking forward to some wonderful cake recipes if your tarte tatin is anything to go by. I shall have to visit your stall next time I visit my brother as he lives just around the corner from Broadway. In fact he spends every Saturday morning doing his food shop at the market. I have to agree with you that it is indeed a wonderful market, I was so jeleous when he took me to wonder around one Saturday as we have nothing like it up here in York. Hi Kate! Do come visit my stall! And be sure to let me know who you are! I’d love to see you! I followed your link, and gosh you have a woderful allotment! Welcome to the blogging world! I look forward to reading more of your entries and also, if you want to share, about how a Japanese woman ended up at a London market selling cakes and chocolates! Lovely site! Am salivating at the thought of all your yummy cakes…am sorry i cant experience them but im confident that they’re sublime. Thank you Clotilde! I probably ended up as a stall holder after… first craving for chocolate & refined sugar (!) during my pregnancy…, & then the Passion for making them had to have some sort of outlet… Having a Saturday-only stall made absolute sense, as I can then still look after my toddler most of the week! – By the way, I love your blog! De wa mata raishu ne! And dearest Layla, I hope the NY is giving you a fruitful time. Keep Warm! Your blog is lovely. I really like the graphic style. I’m enjoying looking at your site here in Tokyo. Thank you for sharing the recipe. I can’t wait to try it myself and better still visit your stall next time I’m in England. It’s great that you have found the perfect outlet for all your amazing talent. Great blog look forward to new entries. Thanks Lusks! It’s all early days & I’m sure there’d be teething problems, but please do keep with it! Your blog is beautiful to read and lovely to look at – your chocs look wonderful. I work full time otherwise I would be a fellow stall holder – albeit far enough away not to be competition! i found your blog fascinating and am leaving a comment on your first post to let you know that i will start reading it from HERE and will read THRU the whole thing !that’s how much i liked it, maybe coz that is what i wanted to do too and always wanted to open up my own place and sell my stuff, anyways you have a STELLAR BLOG, keep it up! Wow, you’re gonna read my blog from the beginning?? That is such a compliment, thank you! Hello Lexi! I use wordpress & dreamhost. Wether I recommend it or not is another matter – as I don’t know any other, so I have no basis for comparison!! Good luck with your blog, & do let me know when it’s up!! Your clear instructions AND your GREAT process pictures really inspired me to try make the tarte tatin and it’s now baking in the oven! I wasn’t sure how long to cook the apples on the hob but I had your blog and this entry on my computer the whole time and after reading for the fifth time, I realized that it was not for too long and then common sense kicked in and I moved on and now the tarte is in the oven! Yeah! Thanks a whole bunch! I had a great time of discovery and now look forward to tasting my attempt on your very comprehensible recipe! hi Su Su. I hope it turned out well… !!! I have a very dear friend that I need to get an urgent present to and I wonder could you help me… I would love to order a flourless chocolate cake and 10 chocolate brownies for him today, if it were possible to have these delivered to Greenwich (SE3) tomorrow, Saturday 26th. I could pay you 15GBp or delivery for a courier, or something in that price region. Do you think that might be possible? If you could give me your phone number I can ring you to discuss it. I live in Ireland, so I can’t collect the items, I’m afraid! Wowww! Thank you for letting me know that I was mentioned in a Slovenian magazine!! Do they have a website? I’d love to know…!! fantastic! love it! you should write a recipe book full of lovely photographs! Tamami- the trick to getting caramel off the cooker is to leave a damp cloth or sponge on it for 20 or so minutes (depends how big a bit of caramel! )…this will dissolve the sugar and BAM you can wipe it away no problems. I discovered this making creme caramel and it has *transformed* my cooking life! Thank you Ad!! All the best!! We love your cakes and we would like to propose you to work with us. Can you please send me an email at chloe.bisiaux@purenchic.com so that I can tell you more? Hi, thank you for your interest. – I will email you shortly. Made this for the first time today for a few friends. Used Braeburns they held up well and had good favlor. Wienied out on the caramel got a nice amber color but should have manned up and gone a few seconds longer. Used store bought puff pastry. There was a fair amount of watery liquid when finished baking; must have been from the apples. We drained most out before flipping, even then it was a drippy affair. Reduced the drained liquid down and got a really nice syrup to drizzle over the whipped cream topped tartin slices. Everyone had seconds; alas, nothing left for tomorrow. One question: could a person use two sheets of pastry dough to get more pastry in the dish? Would you just lay one on top of the other then cut to fit? As for doubling the pastry – I have never tried, so won’t be able to answer, but I would’ve thought not, because the pastry won’t cook to the centre if so thick? Rather, perhaps try rolling the pastry thicker than usual? Worth a try, since the result will still be delicious!